What a pain in the…heel? In running we find that sometimes we get injured. Sometimes we hurt in places where we didn’t know we could hurt! 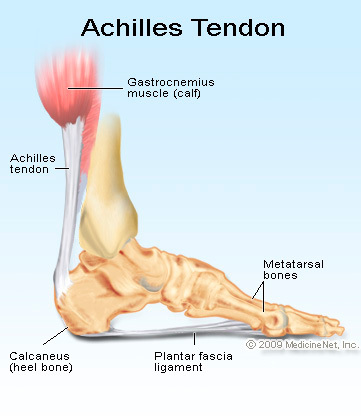 But here is a fairly common injury, the Achilles. When I ran the goofy challenge, it was one of new injuries I got. It hurt to put pressure on my heel and to flex it. Since then I was able to overcome the injury and not suffer from it again so maybe these tips can also help you with your pain and understand how to it. The Achilles is one of the strongest if not THE strongest tendon in your body. It connects your calf muscle to your heel. Every time you flex your foot, your Achilles is at work. – A tight or sore calf. – Too much hill or speed work. – Improper or insufficient stretching. – Improper shoes that allow your ankle to be loose, which makes your Achilles unstable. – Overpronation can also cause Achilles pain or injury. – Over training or pushing the tendon pass its limits. – Improper training or doing too much too fast. – Sharp pain along the back of the heel. – Redness along the tendon in the back on your lower leg to your heel. – a lump along the Achilles, which is scar tissue. – Dull or uncomfortable pain when the heel is flexed. – A popping/cracking noise associated with the pain. – If you feel pain when you are running, STOP. 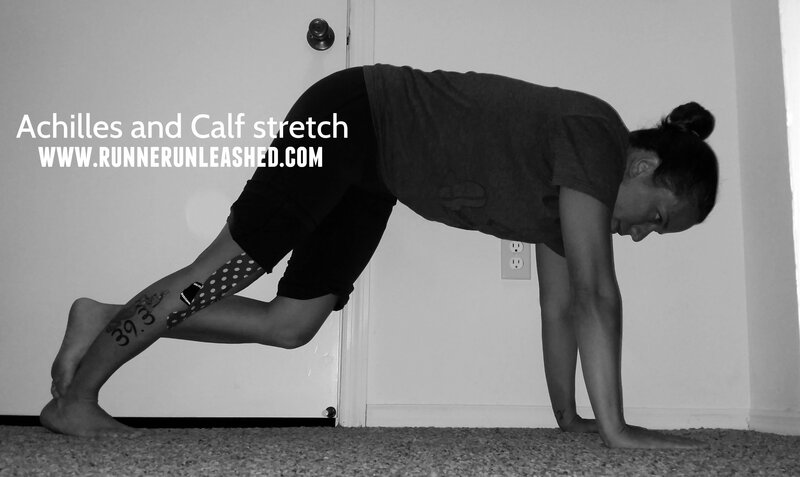 – I have always been a BIG believer in stretching. I know many of you don’t or only do it when injured, but of you stretch on the regular, you can the pain from even starting. – If you are prone to Achilles pain, wearing heel support, or shoes that promote ankle stability can help reduce chances of the injury. – Strengthening your lower leg can also help, as those stretches posted above, they help. – Start slow, don’t go crazy and start off with a big amount of miles or speed. If you already are suffering from Achilles Tendinitis, here are some at home remedies that can help you recover. – Icing is my go to for ANY injury or pain. The icing certainly help ease the pain, the swelling, and the discomfort. 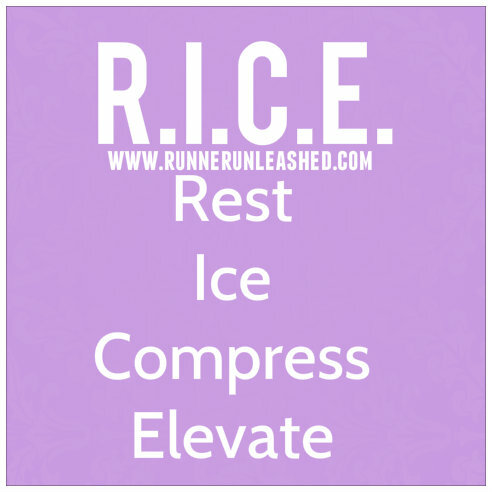 Using the R.I.C.E. is helpful with any injury, not just this one. Use some icing method on your area of pain for about 20 minutes. – Getting a massage or using a massage stick can also reduce the tension within your muscles and tendons. – Doing some cross training or other activities that involve little to no impact can be a good change from running. Swimming is always a good choice, it’s no impact and you can work on strengthening. 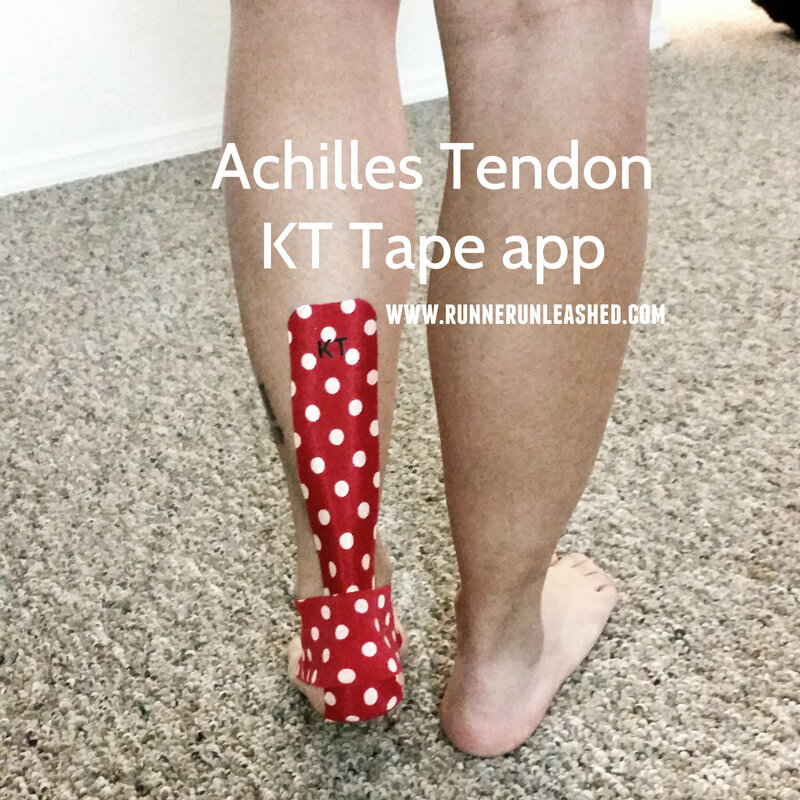 – Another way to combat Achilles pain is with KT Tape. 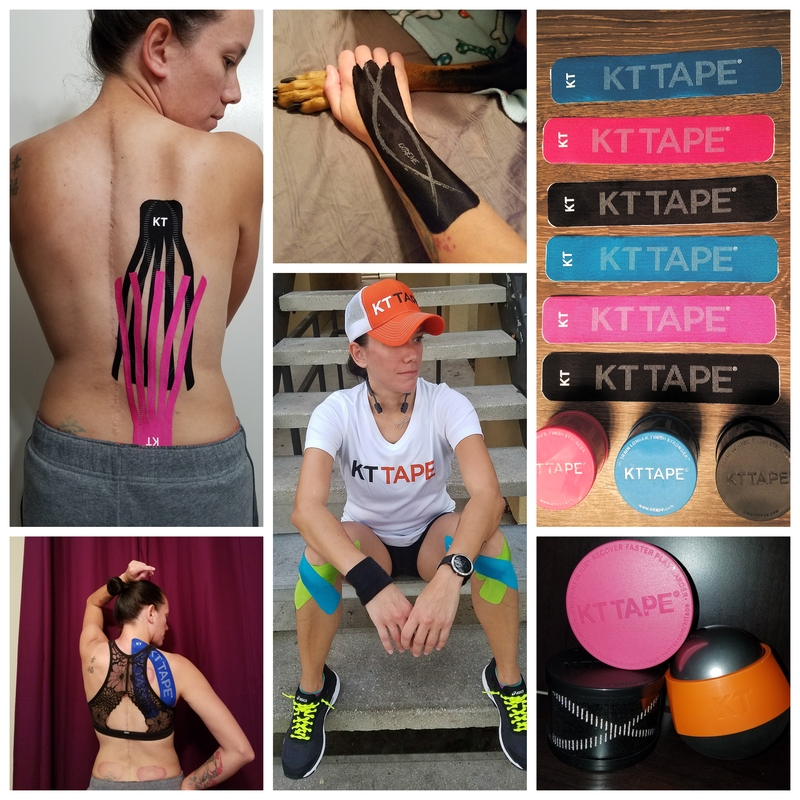 Since there is little blood circulation to that area, using KT Tape will promote blood floor to allow it for a quicker recovery time. The blood will reach the injured area smoother and easier with KT Tape which means you’ll be running sooner than later. If none of these self care remedies work and the pain is still there and unbearable, it might be time to have your Doctor check it out to make sure it isn’t a more serious problem. If you address this injury right when it flares up, you can reduce the chances of it being a serious problem, or even missing out on a race. Don’t just “run through the pain”. Listen to your body and the signals it gives you. I think it’s much better to sit out a few days, maybe even a week, than to sit out for months from running. Be smart about your injuries. 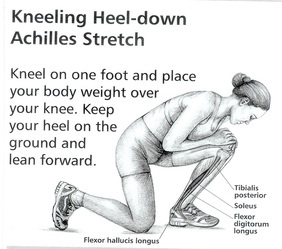 Once your Achilles pain is under control and you can manipulate it, then start massaging, stretching, moving it. Improper care can just aggravate it. Really informative post. I dealt with this on and off for 4 months, just from trying to do too much. I used RICE and KT tape along with a little time off and everything is good! I appreciate the information on how to get rid of heel pain the right way, it was very helpful. I agree that one of the best ways to help with heel pain and foot pain is to stretch it out and make sure you are massaging the affected areas on a regular basis. My mom has been experiencing some heel pain recently and she hasn’t been able to get rid of it, I will be sure to share this with her.